Hyundai has been working diligently these past few years to alter their image. They entered the American market as an economy brand but through their new models and redesigns, they are working to blend economy, performance, and luxury. 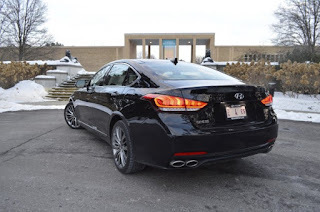 The 2015 Hyundai Genesis is the flagship of this movement; it packs the luxury and performance of better known luxury brands with a price tag more accessible to mainstream America. While many features come standard, this car is anything but standard. Hyundai allows its customers to choose between all-wheel and rear-wheel drive-trains to better serve the Genesis’ performance. Inside the cabin there are many options ranging from safety and performance as well as comfort and convenience. Hyundai gave the Genesis a complete overhaul inside and out. It has the look of a car that will be as fun to drive as it is to be seen in. The first thing we noticed was the aggressive styling of the exterior. The extended wheelbase combined with the cabin being edged towards the back gives the impression of a longer car. With the much improved exterior styling, Hyundai had quite the job of maintaining the momentum on the inside. The Genesis matches its performance/luxury exterior with many innovative and in demand features on the interior. Hyundai offers available adaptive suspension, eight-speed automatic transmission, laser guided cruise control and lane keep assist just to name some of the biggest tech features. The 2015 Hyundai Genesis has earned its place among the more traditional luxury, performance competitors. No matter how great the exterior of a vehicle is, we still spend the vast majority of our time inside the cabin. With that being said, the interior of any vehicle must meet the needs of the driver. This is especially true in the luxury market as the interior has a way of separating the champions. The Hyundai Genesis makes a bold push into the luxury market with many features that you would expect from the traditional powerhouses. What really sets the Genesis apart here is the $38,000 starting price. It is much easier to stay under budget while getting all of the features you want in this vehicle than a 5-series BMW or an E-Class Mercedes; two popular luxury brands upon which Hyundai has targeted. Our press car came equipped with the Signature, Tech, and Ultimate packages. Even with all of these packages, the price tag stays under $60,000 and gives you every bit of luxury one could want. As we said before: Hyundai has done a wonderful job of blending safety, performance and luxury – this was obvious when we looked at the options in these packages. For our safety concerns, Hyundai included HID headlights, blind spot detection, lane departure warning/assist, Haptic steering wheel, front and rear parking assist, as well as a Heads Up Display, or HUD. We are fans of all these features, especially the Heads Up Display. However, we did find the lane departure assist to be a bit overly aggressive, particularly around curves on the expressway. The highlights for us with luxury were the panoramic sunroof, the leather appointed seats with thigh extender, side bolster, and memory settings, power rear sunshade and a power trunk lid. A fantastic, 17 speaker sound system was a nice treat too. In the luxury marketplace, it comes down to the little things and Hyundai did a wonderful job with these finer points. Power and performance have always been important attributes when deciding on a vehicle. What’s the point of having a nice car if it isn’t fun to drive? Hyundai offers us two athletic engines to choose from on the Genesis. The base engine is a 3.8 liter V6 producing 311 hp @6000 rpm and 293 lb-ft of torque @5000 rpm. Its fuel economy is rated at 16 mpg city and 25 mpg highway. Those are pretty good statistics for a luxury car and it manages to hustle to 60 in 7.2 seconds. 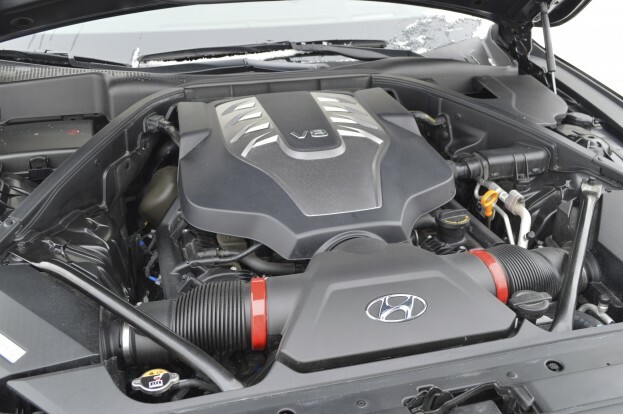 For those of you that feel like you just need a bit more muscle under the hood, Hyundai offers the powerful 5.0 liter V8 producing 420 hp @6000 rpm and 383 lb-ft of torque @5000 rpm. Its fuel economy is rated at 15 mpg city and 23 mpg highway. Over the course of our time with the 5.0, our fuel economy came out to be 14 mpg city 26 mpg hwy. The 5.0 adds an additional 250 lbs. for a total weight of 4,541 pounds for the Genesis. The added weight and lower fuel economy didn’t really matter to us as we were rocketing off the line. We’ve told you how much we enjoyed both of the engine options while accelerating off the line but how does the Genesis handle the rest of the trip? The Genesis is a heavy car and this shows up, not with the acceleration, but in the corners. It handles the weight well, with the it being distributed in a way that helps performance, yet you certainly feel it. The steering can feel a bit dull as a result – but it is more than adequate for this type of car. Regardless of the engine you choose, the Hyundai Genesis comes with an 8 speed transmission and a very good one at that. We found it to be one of the best we have ever driven. It’s quick, crisp shifts really make driving it that much better. Unlike other 8 speed transmissions, it doesn’t hunt for 7th and 8th gear; when you need to put the power down, it shifts quickly, even at redline. With all the power the 5.0 offers, the 8 speed handles it with ease. Combine all of this with the adaptive cruise control and you can soak up those long miles on road trips with ease. Hyundai did something special with the redesigned 2015 Genesis. They wanted to run with the big dogs of the luxury world and they built a car that could join the pack. Building a luxury car is more than leather seats; it’s about style, personality and even a little swagger. With the Hyundai Genesis, it’s about the craftsmanship on the interior and the attention to detail. Hyundai added features you are only accustomed to finding in the traditional, powerhouse sedans. Aesthetically, it is difficult to find a fault on this vehicle. That’s not to say there isn’t room for improvement. We would like to see them lower the weight, offer the 5.0 with AWD and we’ve mentioned the lane guidance can use some fine tuning. However, these aren’t the things that are going to hold back the Genesis. 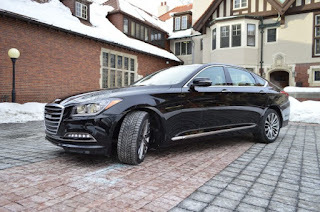 What will probably prevent people from buying the Genesis is that it is a Hyundai. You can see that Hyundai is trying to mitigate that by removing the typical slanted H logo and developing a crest unique to the Genesis. Will this be enough? Will people be willing to take a shot on a wonderful car if it doesn’t come from a brand that others will envy?